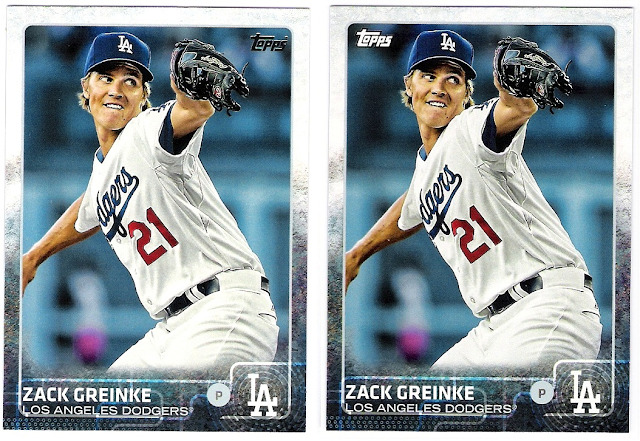 with the release of 2015 topps series 2, i figured it was time to address the differences between the topps 17-card factory dodger team set and the good ol' flagship cards. 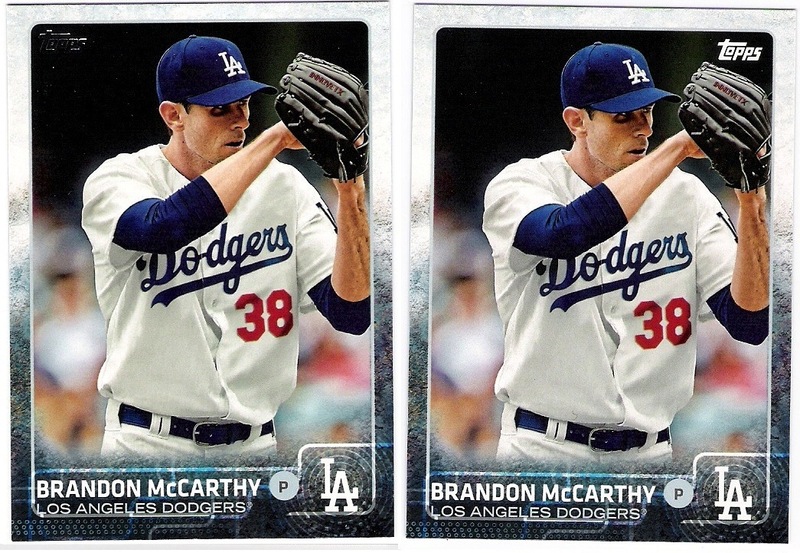 last year, as you might recall, there was a dodger stadium card included in the factory set (which was nice, but had become somewhat repetitive), and the only other variation was the orientation of brian wilson's card. 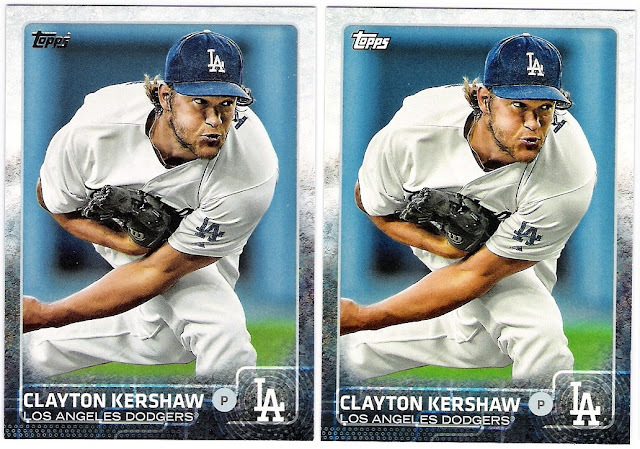 before i begin with the side-by-side stuff, i'll note that topps did not add a set descriptor to the backs of the factory team set cards, as they are numbered 'lad-#', with clayton kershaw being the first card up. so far, only series one and series two have had the descriptor above the card number. here we go - flagship on the left, factory team set on the right. the only foil on this year's flagship cards is the topps logo, and the factory set cards replace it with white fill. 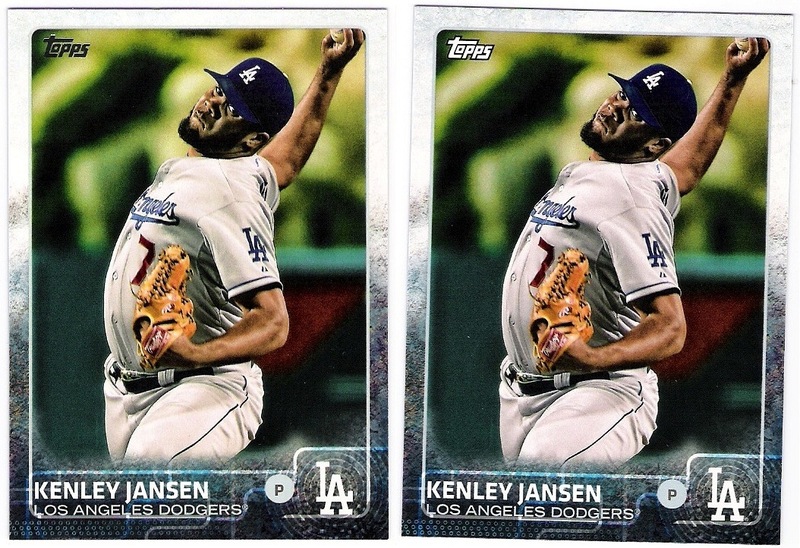 that's the only difference between these two cards. ethier, who was probably on the fence as far as inclusion in the factory set, has essentially the same card. 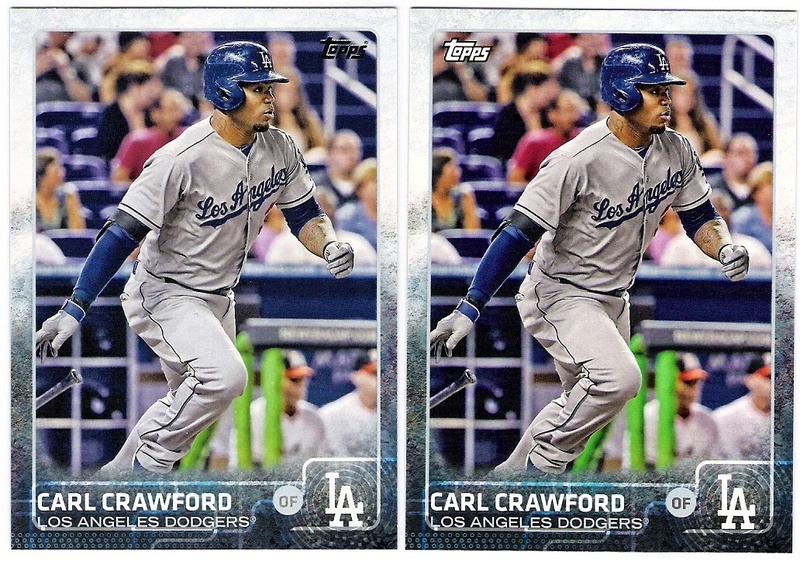 the only difference is the location of the topps logo. 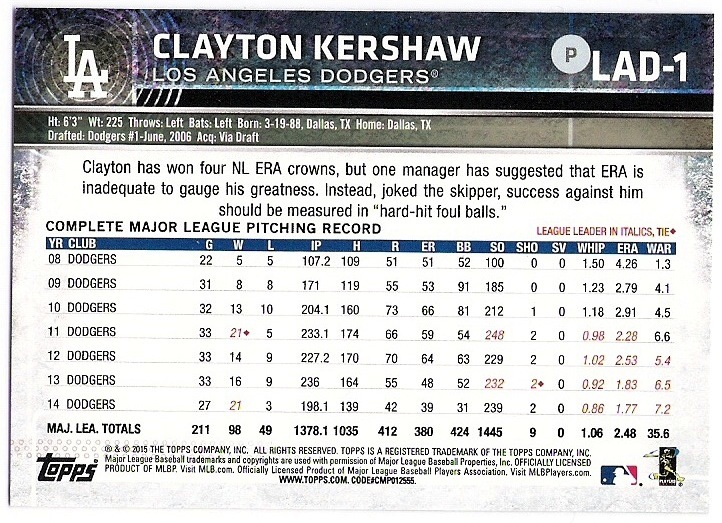 i would have thought that justin turner had as good a chance as ethier to make this year's checklist. 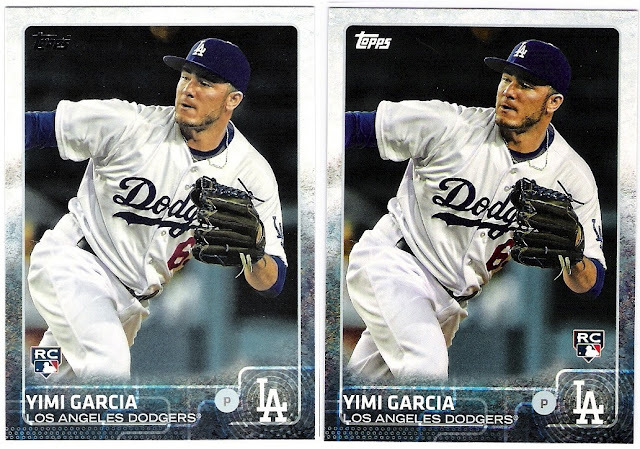 yimi's topps logo remains in the same spot, but his rookie card designation got moved, which is an improvement over the flagship card. 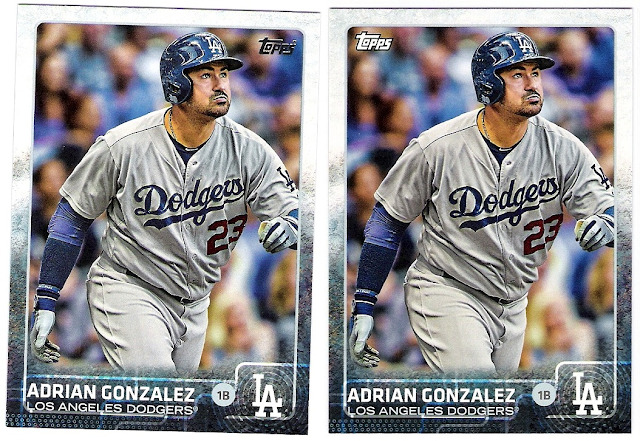 the topps logo made a move on gonzalez's card, which i see as an improvement. again, the topps logo moved, but everything else remains the same. 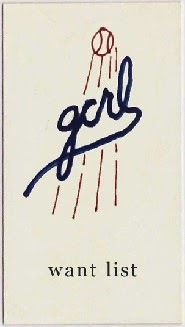 this is the star of the set, folks. 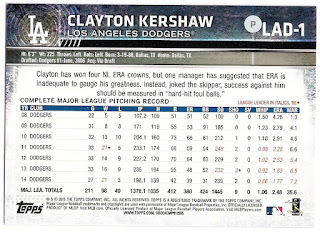 the series two card shows ellis in his catcher gear on the road while the factory set used a photo of ellis from last year's playoffs - nlds game 1 at dodger stadium - in which ellis hit a home run. 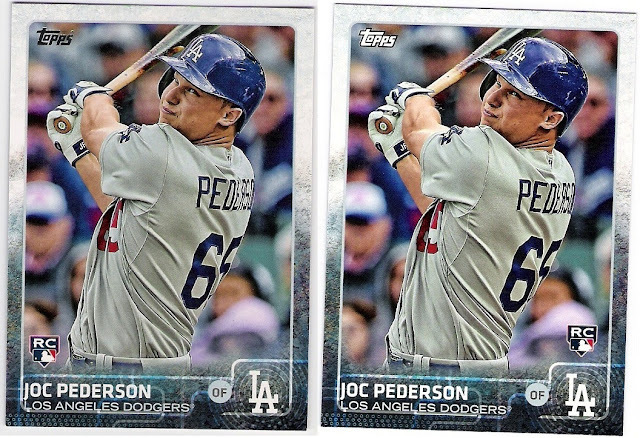 he was 4 for 5 in that game, but has only 12 hits in 26 games this season. 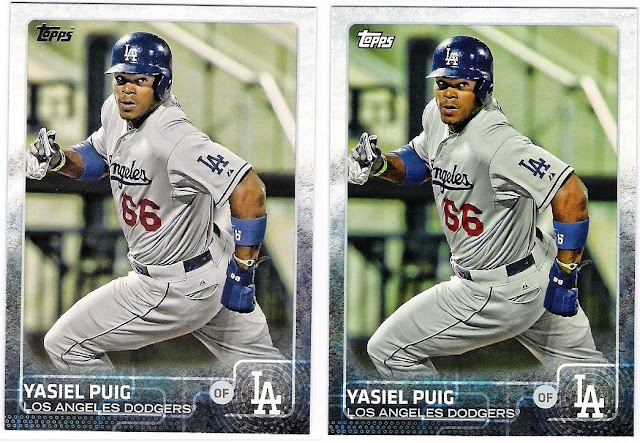 the topps logo remains in place, but the rookie card designation migrated to the other side of the card. the topps logo moved to a better location. seriously, does topps give no thought to where the logo appears? there is no consistency as far as one corner or the other, so i would think that if the logo were to be moved, there would be some effort to put it where it doesn't land on top of a players' elbow. i guess not. ok, now i've come to the point where maybe i should have waited to do this post. grandal had a card in series one, but he was shown as a padre. 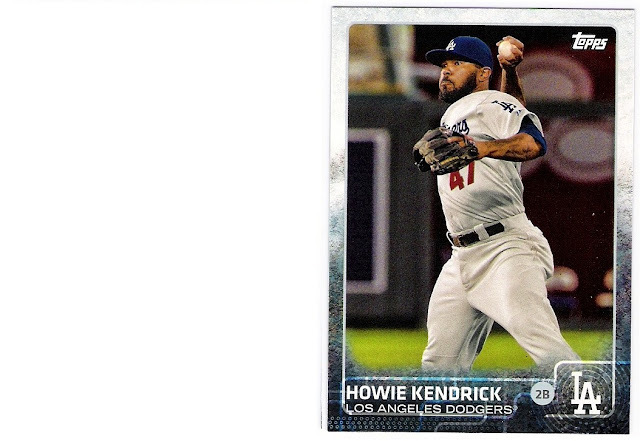 the factory set photoshopped him into todd hundley's old uniform, which is actually a good job by topps. grandal wore number 8 with the pads, but switched to number 9 for the dodgers, and topps took notice of that. 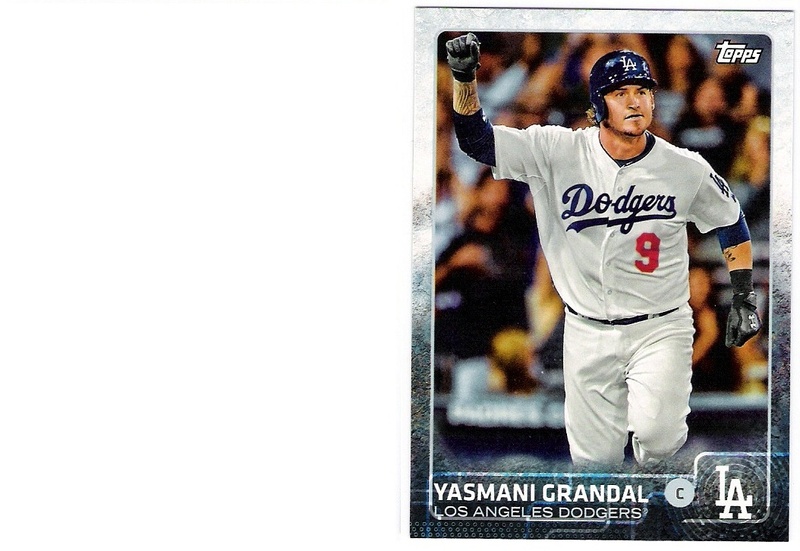 anyway, grandal should get a card in the update set and we will have to wait and see whether or not it matches this one. topps did get rollins switched over to a dodgers uniform in the flagship set, but they did not do as well with his photoshopping as they did with grandal. 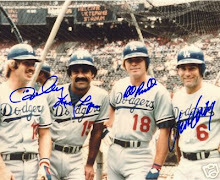 i guess that they did not anticipate him wearing number 11 as a dodger, even though that was the number he wore for most of his phillies career. oh, there's no substantive difference between the two cards. kendrick is in the same boat as grandal - he had a card in series one as an angel, and so we must wait until update is out to make a comparison between his dodger cards. 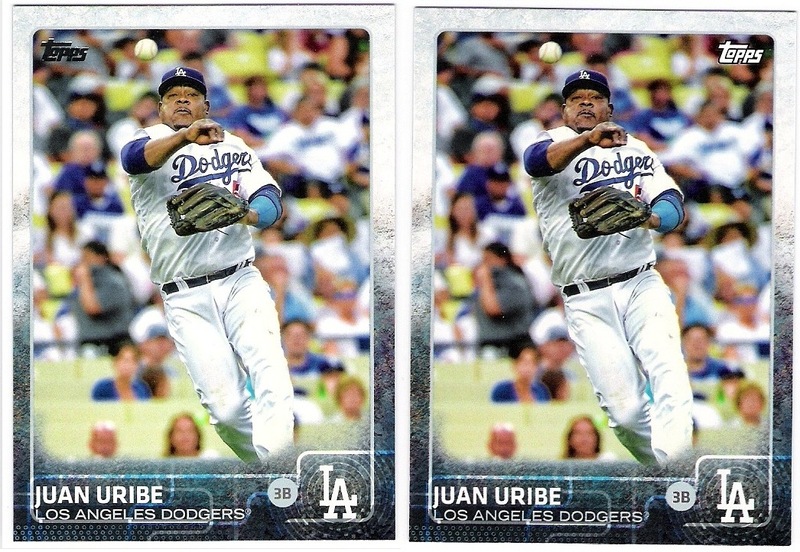 uribe should be in update, too, but he'll be wearing a braves uniform. here, only the topps logo location is different between the two cards. mccarthy made four starts as a dodger, and was 3-0. it helps when the team averages about 8 runs per start, however, as mccarthy's era was just under six. as for his photoshopped cards, topps got the number right, and then decided that the logo would look better in an already cluttered upper right corner instead of the open and dark upper left corner. 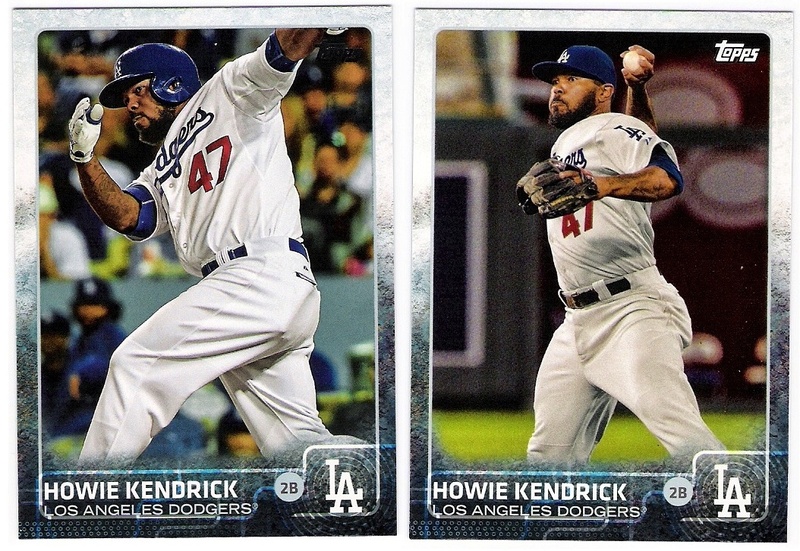 so, no dodger stadium card. 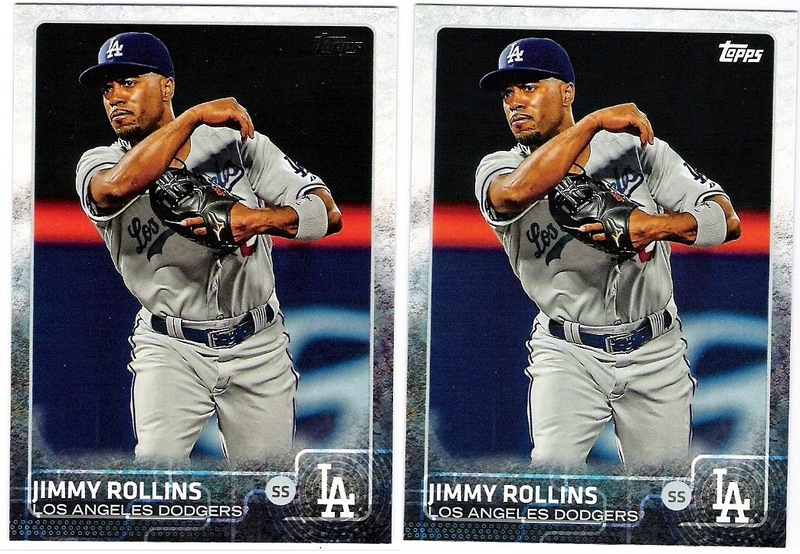 no don mattingly card. 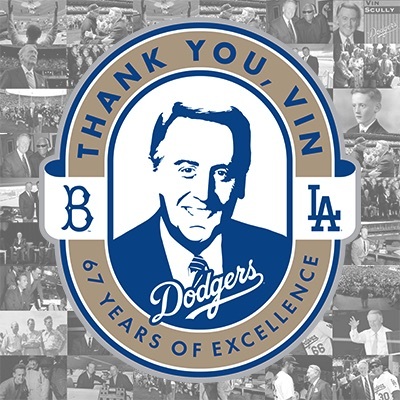 no alex guerrero or carlos frias or justin turner, for that matter. 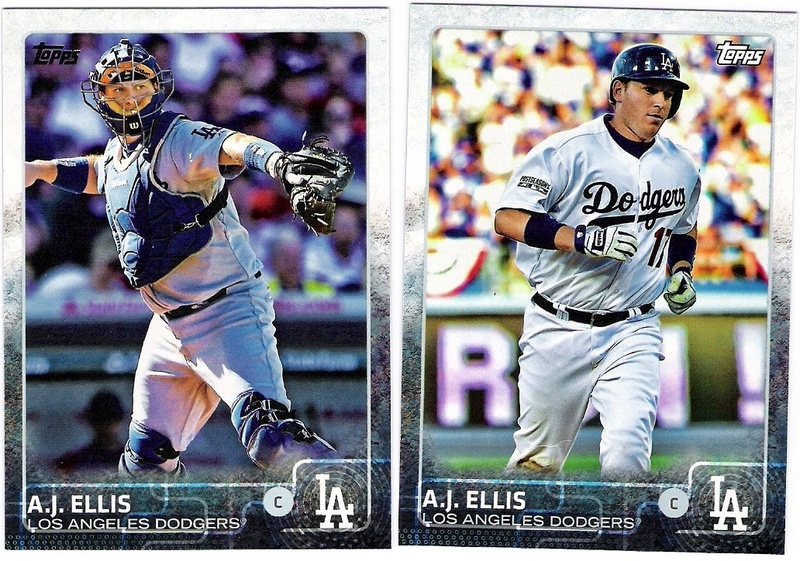 just some strange decisions on logo placement and a second guessing of photo selection for aj ellis. 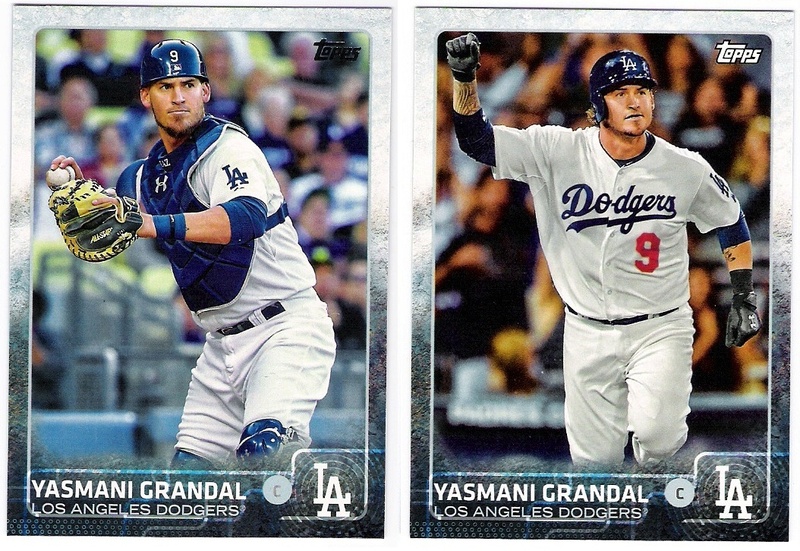 maybe grandal and kendrick will get real dodger photos in update and there will be three variant cards in the factory set when it's all said and done. we'll have to wait and see. At least one of the photos was different. 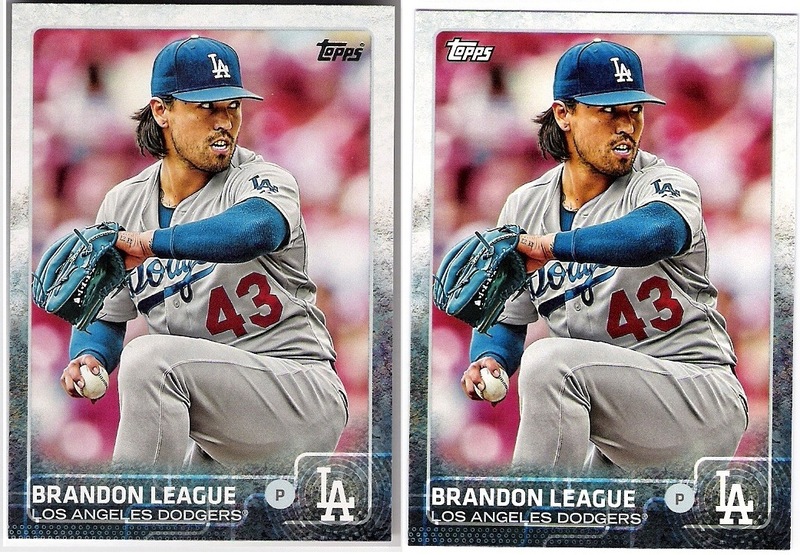 The Mets set matched all the flagship cards (save for logo relocation, etc. 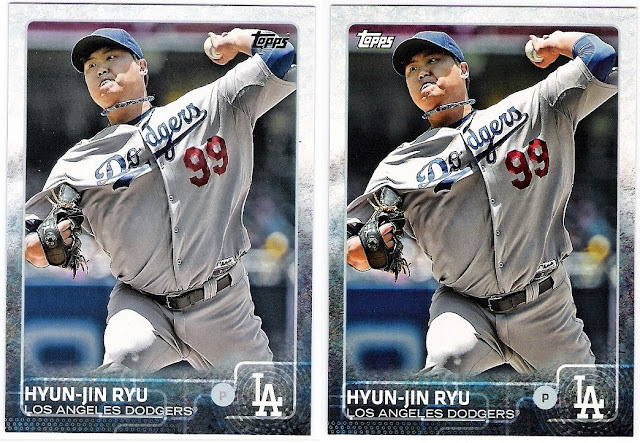 ), which is a total letdown. Thanks for sharing these... 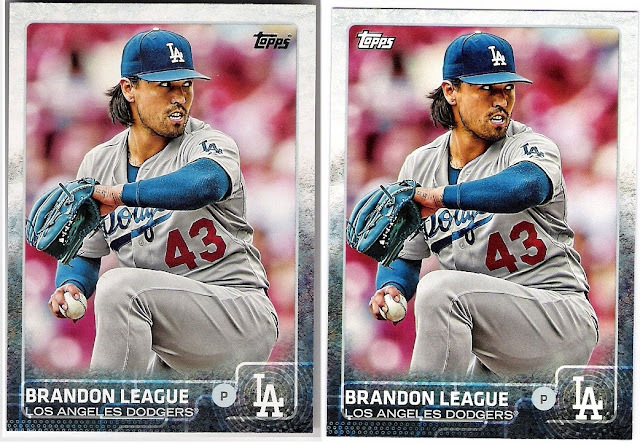 I always enjoy these comparisons, even for teams where I'm not a collector. ...And thanks to Mark for letting me know in his comment that the Mets set isn't worth getting.